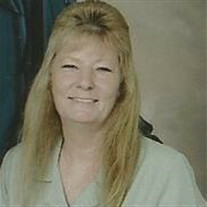 Phyllis Kay Hensley, 62, passed away June 6, 2017. She was born July 9, 1954. She was of the Baptist faith. She was preceded in death by her parents Marvin Stanley and Doris Stanley; her brother Marvin L Stanley; and her nephew John Chastain. She is survived by her sister Regenia Matheney; four nieces; five great-nieces, and one great-nephew. Visitation will be Thursday, June 8th from 6-8 PM at the Willis Funeral Service Chapel. Graveside service will be Friday, June 9th at 2 PM at Roosevelt Cemetery. Pallbearers include Larry Branscum, Blaine Crymes, Greg Huckabee, and Tim Wilf.